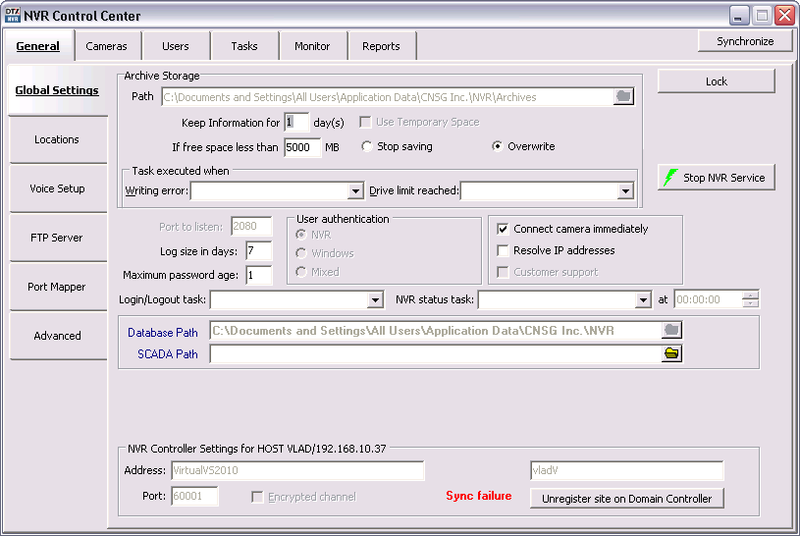 When a registration request from a child NVR is accepted the NVR Domain Controller imports the NVR cameras settings to the domain database held on the NVR Domain Controller. After that the domain database will be synchronized automatically — any updates made in the cameras settings on the NVR Domain Controller will be automatically propagated to the child NVRs and vise versa. However, the synchronization could be lost if the connection between a child NVR and the domain controller is temporary broken. Notice that the DETEXI NVR domain continues to work in full configuration even if the connection between a child NVR and the domain controller is temporarily broken. However, the updates for the domain database at that time will be rejected; while the updates for a child NVR data from its own NVR Control Center will be still allowed. If a child NVR cameras settings were updated during a connection failure the synchronization with the domain database will be lost. The synchronization must be restored when the connection is established. To synchronize the domain database with the child NVR updated settings the NVR data should be imported to the domain database. The Domain Controller users list, its own cameras and tasks could be updated at any circumstances. A child NVR users list is used by the NVR only and its updating can not cause a synchronization failure. If a child NVR cameras settings were updated during a connection failure the synchronization with the domain database will be lost. The synchronization must be restored when the connection is established by importing the child NVR updated settings. The synch failure message will appear in the child NVR Control Center — General — Global Settings under the NVR Controller Settings for HOST at the bottom. The message will also appear in the domain controller NVR Control Center — General — NVR Locations. The child NVR location name in the NVR Control Center — General — NVR Locations — Servers Locations list will stay red until the synchronization is restored. Select the NVR location in the Servers Locations list. Click Import button to import the NVR cameras settings. Provide credentials and wait until the data import is completed.